Speaker 1: It’s a Northwest Lifestyle Weekend on KOMO News. Now, a show for anyone who is or has a boss. This is ‘The Boss Show’, with Jim Hessler and Steve Motenko. Jim Hessler: And a stand-up guy, too. Steve Motenko: Thank you, sir. Jim Hessler: I’m Jim Hessler, the business guy. I’m the founder of Path Forward Leadership Development and the author, along with Steve, of the book ‘Land On Your Feet, Not On Your Face’, and I’m also a pretty stand-up guy, too. Most of the time. Steve Motenko: You had to say it, because I wouldn’t say it. Steve Motenko: I’m petty that way. Jim Hessler: Yeah, you are, yeah. Other than that I love you, though. Steve Motenko: That refers to part one of our interview, which you’re going to want to check out on thebossshow.com. We’re also, by the way, available on Stitcher, on iTunes, and on Soundcloud. Jim Hessler: Can we do a little context setting here. We had Emily Parkhurst from the Puget Sound Business Journal on the show recently, and she talked about how she had kind of grown up wanting to be a scientist or a biologist and really got discouraged from doing that by a number of different people, and also feeling very much of a fish-out-of-water being a woman in a male-dominated scientific world. So, that’s what our listener Margaret is responding to in this message. Steve Motenko: Yeah, yeah, thanks for that. We wove in some statistics about how women are really behind the 8-ball in a lot of ways in terms of their engagement in STEM [crosstalk 00:01:45]. Jim Hessler: And much more likely to quit their education prematurely. Jim Hessler: Rather than finding them go all the way through and get their degree. Steve Motenko: Hugely, hugely unfortunately. Jim Hessler: If I ever had a rock band, I think I’d name it, like, “Mediocre White Dudes”. Steve Motenko: “Mediocre White Dudes”. Yeah, what a great straw man, right, to poke holes into? Steve Motenko: One thing that occurred to me about this, other than how sad it is and how too many of us don’t take the time to empathize with this phenomenon, how sad it is that so many women are subconsciously discouraged from pursuing careers that are true callings for them or manifestations, potentially, of their mission. Another thing that occurred to me in reading what she wrote was the Star Trek references. Jim Hessler: Mm-hmm (affirmative), yup. Steve Motenko: And how the media can powerfully, in a subconscious way, be positive forces. Jim Hessler: … Was on the original Star Trek. Steve Motenko: Right, between Captain Kirk and Lieutenant Uhuru, and they were being forced to kiss by an alien power. Jim Hessler: That’s right! But it happened on television, yeah, yeah. I think the other thing that stuck out for me out of our conversation with Emily Parkhurst was just how subtle this can be, too. You don’t have to be a raging sexist to give people discouragement about their course of action. I think we all need to be just very mindful of how we’re showing off body language and gestures and terms of speech and all that. Steve Motenko: Not only that, but we need to be very mindful. I mean, in a way it’s almost self-contradictory, but we need to be mindful of what we’re not aware of. We need to be mindful of how we may be treating women differently from men in ways that are beneath the radar of our consciousness. Jim Hessler: Tough to do, but it can be done. Steve Motenko: Continuing with our conversation with Howard Behar of Starbucks when we come back. Stay with us! You’re listening to ‘The Boss Show’. Speaker 4: It’s a Northwest Lifestyle Weekend on KOMO News. ‘The Boss Show’ continues. Jim Hessler: Hello! We’re so glad you’re with us. I’m Jim Hessler, I’m the business guy. Steve Motenko: And I’m Steve Motenko, I’m the psychology guy, and the third person that you can’t see in this KOMO studio is Howard Behar, who is the founding President of Starbucks International. Jim Hessler: That would be 5 continents, Steve. Jim Hessler: Unless you’ve changed planets? Jim Hessler: Sometimes it feels like you’ve changed planets? Steve Motenko: My mouth gets ahead of my brain or vice-versa, yeah. Anyway! I think Starbucks is up to 23,000 stores now, which is just a crazy number! Howard is the author of two books on leadership. One, which we talked about last week and will continue to talk about in this part two interview, is ‘It’s Not About The Coffee: Lessons on Putting People First From a Life at Starbucks’, and the newly released leadership fable is his second book, it’s called ‘The Magic Cup’. A really intriguing, fantastic read full of fantasy. Howard, once again, welcome to ‘The Boss Show’. Howard Behar: Great to be back! Steve Motenko: Tell us a little bit about the ‘Third Place’ concept. What is it, where did it come from, how instrumental was it in the vision that created what we know of as Starbucks today? Howard Behar: The ‘Third Place’ stands for the place between home and work. We have a place where we work, we have a home that we go to, hopefully, and the ‘Third Place’ became the café concept. Now, we fought it at the beginning, believe it or not. We thought we were in the coffee business, but we weren’t. We were in the people business. When you’re in the people business, and people were telling us, “Hey, we want a place to sit down.” At that time, we had five little bar stools in our windows, so it could hardly sit anybody! Somebody would come in and get a cup of coffee and they’d have to leave. As they kept telling us more and more, “We want a place to sit!” We kept adding more and more chairs until finally our stores grew from very small stores to pretty good sized stores. Howard Behar: That was very early on, and we saw that, and of course that led to a whole different kind of business. You go into a Starbucks, you could sit there, never order a cup of coffee, just sit there with a book or your computer and do your work or read or whatever you want to do or just think, and nobody’s going to bother you. I mean, think about any place that you can go that you can do that! Maybe the library? Howard Behar: There were huge arguments we had inside the company. Steve Motenko: I bet there were! Howard Behar: The real estate people were just, you know- I was the operator side of the business, so the real estate people would say, “You guys are crazy! We never can afford that.” And we kept saying, “Yes we can! It will work.” And they said, “People will stay all day!” I said, “Some will, but most won’t. We’ll be the place where people want to go and hang out.” And that’s exactly what it turned into. Young, old, rich, poor, policeman, fireman, teachers, you know? Unemployed people, whatever it is, they all can kind of come in and it’s an equal place for everybody. Students. I’m always amazed at how many students are in there studying together. I think, you know, it’s turned into a place that people can go. Not only in the United States, but throughout the world. That’s what amazes me the most. Steve Motenko: We mentioned in part one of the interview that you’re an idealist, and we talked a little bit about reconciling idealism and pragmatism in business, in the business context. One thing that you mentioned. You talk about values and purpose a lot in your book, especially in the first principle that you unpack, which we talked about a little bit in part one, called ‘Know Who You Are: Wear One Hat’. My question for you about this is: values and purpose exercises way too often, in our experience, and I’m speaking for Jim here too, I know he’d agree because I know him pretty well, way too often their values and purpose exercise ends up with a deliverable that sits on the shelf and never gets paid attention to again. How do you guard against that happening? Howard Behar: You have to integrate them into who you are. It’s not a piece of paper. You may put them on a piece of paper, but it’s the way that you live, and you have to think about them every day. And you have to hold yourself accountable. Steve Motenko: How do you do that? Jim Hessler: It’s called ‘leadership’! Howard Behar: Well, yes, in a sense, but leaders are fragile. We’re just human beings. We forget all the time, and so you have to build in mechanisms into your organizations that allow your people to challenge you based on what they believe you said about your values. That’s really an important one. If it’s just top-down it doesn’t work. It has to be bottom-up, top-down, and there have to be mechanisms in place that hold each other accountable to those values, just like you do in a home. It’s exactly what happens in a marriage. Steve Motenko: We’ll talk more about those ‘Bottom-Up’ values and how they’re implemented at Starbucks when we come back. It’s ‘The Boss Show’. Speaker 4: Now back to Jim Hessler and Steve Motenko. This is ‘The Boss Show’, on KOMO News. Steve Motenko: And I’m Steve Motenko, I’m the psychology guy, and we have in studio with us Howard Behar, one of the founding fathers of Starbucks. If you’re interested, if you’re enjoying this interview and the one last week, this is a part two, you might check out a public event sponsored by the Seattle Chapter of Conscious Capitalism on May 17th in which I’ll be interviewing Howard in front of a group of people. Maybe you’ll be there at the a the Impact Hub in Pioneer Square! Howard, talking about the principles that you lay out in your book ‘It’s Not About The Coffee’, your second principle is ‘Know Why You’re Here: Do It Because It’s Right, Not Because It’s Right For Your Resume’. In the context of this chapter, you mention that after being criticized in your early career for appearing unprofessional by “wearing your emotions on your sleeve”, you said, “I needed to learn how to bring my emotions to work.” Say more about that. Howard Behar: Well, I needed to learn how to make my emotions productive. I’m not telling you that I was ever great at it because I’m a highly emotional guy, and what’s in my heart is usually what comes out of my mouth. Now, some people can deal with that and some people can’t deal with that, and so you have to learn when to use it, when not to use it. That’s always a difficult struggle, particularly for me, but I think that you have to show emotion at work. People want to know that you care! They want to know that there’s something behind all this stuff. If it’s just PNL statements and facts and numbers and all that stuff, then why be there, you know? Jim Hessler: We can roboticize that! Howard Behar: Well, that’s what I worry about in today’s world, you know? It’s becoming a transaction world. We don’t talk like that in our marriages, with our kids. It’s not about transactions, it’s about relationships. Jim Hessler: Yeah, it seems only in business that that exists. Howard Behar: Yeah, and it doesn’t need to be that way. Jim Hessler: Where did this idea come from, do you have any idea? That we have to leave our emotions at the workplace door? Howard Behar: Don’t you remember that old statement, “Don’t bring your problems to work. Leave your emotions at home.” No human being does that! You may think they’re doing it, but no- It may be buried, but it always affects who they are. What’s the best way to deal with that? It’s to ask the person every day, “How are you doing today? What’s going on?” And particularly if you see something going on, let it come out. That’s what we want to do at home. I like to put the two things together. Home and work, same thing. Howard Behar: It allows people to be human. Emotion is important at work. Not destructive emotion, but productive emotion. Steve Motenko: Right, finding ways to work through, to process that emotion in healthy ways. Steve Motenko: Because it’s at the source of all motivation, emotion is. Jim Hessler: And emotion becomes destructive when it’s not dealt with. Howard Behar: That’s right, when you try to bury it. But what struck me is that processes are rules, and hasn’t Starbucks thrived and grown largely because of processes? Howard Behar: Yes, no question. There are processes inside of any organization, whether it’s a family or whether it’s a business. Processes for safety, processes for counting the cash, all those kinds of things. Steve Motenko: Processes for making the coffee! Howard Behar: Yeah, for making coffee. Steve Motenko: So that it’s the same at one Starbucks as at another. Howard Behar: And we had those, but if you think about Starbucks, it tips all that on its head, because if you came in and you said, “I want my latté extra hot, a half a shot of vanilla, and I’d like a quarter inch of foam on the top.” That throws the recipe completely out of whack. Think how hard that would be to do if this was the only way you made the burger, right? Howard Behar: Or the only way you made the drink. We had to teach our people to be flexible at one end, but always had a base they go back to. That’s who we are as human beings. What’s our core? That’s what we go back to, but then who we are as human beings. Steve Motenko: More with Howard Behar! You’re listening to ‘The Boss Show’. Speaker 4: KOMO News. ‘The Boss Show’ is back on a Northwest Lifestyle Weekend. Here’s Jim Hessler and Steve Motenko. Jim Hessler: I am Jim Hessler, and I am widely known as the business guy. Steve Motenko: And I’m Steve Motenko, I’m more narrowly known as the psychology guy, and we have again in studio with us Howard Behar, founding president of Starbucks International. Howard, in the next chapter of your book, which is called ‘Build Trust: Care Like You Really Mean It’, and oh by the way, I say ‘your book’ but you’ve got two books, a recently released ‘The Magic Cup’, which is a leadership parable, and the book that we’re talking about today mostly, which is ‘It’s Not About the Coffee’, which is all about Howard’s leadership lessons from being at Starbucks. How the hell did you do that at Starbucks? Or do you try to do that at Starbucks? Howard Behar: No, we always try to do that at Starbucks. It begins with the most basic of things. I used to send birthday and anniversary cards to everybody that worked in the company, up until we had 10,000 people and then I had to have help. I’d take boxes of cards on airplanes, and I’d fill them all out. I’d write personal notes, I’d sign them personally, I’d put them in a FedEx envelope and send them back to an administrative assistant. Steve Motenko: That’s commitment to a people centered organization! Howard Behar: That’s about keeping the place small, and real, and meaningful for people, and you can do that. It’s how you make decisions. When you’re always thinking about people first, then it shrinks it, you know? You’re not thinking about people in the context of these huge organizations. It’s one person at a time. It’s just like one cup of coffee at a time. You know, you’re serving one human being at a time, so if you get your brain down to that and always be thinking about it that way, then that’s what makes it work and that’s what keeps it small as you’re growing. Steve Motenko: There’s clearly such passion in you for these people centered practices that are embodied by small organizations. You talked in part one of our interview last week, which by the way you can find on our website thebossshow.com or through Stitcher or iTunes or Soundcloud, you talked about some conflicts between your vision and Howard Shultz’ vision. Was this one of them, or were you all on the same page about this kind of small organization approach to running a large organization? Howard Behar: No, I mean, we all wanted it to be that way. Howard always said that, “We don’t want to just be big. We want to be good.” And that meant being small, and touching people. When you’re focusing on touching individuals then it works. There’s no other way to explain it. It’s not different than in a family, like any. You touch the one child, you touch the other child, it’s what they need as each individual, and that’s what we try to do. We kept it that way, and we kept working it. It wasn’t easy. I’m not going to tell you it was easy. I went from being the guy that had my finger in a lot of different things, to realizing all my fingers had to be only in the people. I gave the same speech 10,000 times. In many different ways, with different words, but same thing. That we were about people in this company. The second thing we were about was great coffee, but people was always number one. At Starbucks, you couldn’t get fired for missing your numbers. It was really hard to get fired for missing your numbers, but if you treated people disrespectfully, and I don’t care, it didn’t make any difference what level of the organization you were at, that was a fast way out the door. Steve Motenko: But being all about people means you’ve got to be all about trust. Steve Motenko: And the larger you get, just the numbers game means that there’s going to be more and more people, not a higher percentage, but more and more people who abuse that trust. Steve Motenko: How do you handle that? Howard Behar: Well, you know, you don’t get it all the time, but if you drive it through the organization so that from the person who sweeps the floor, the barista, whatever job it is every job is meaningful, then those people hold the others accountable. You have to, again, create the mechanisms. We had a mechanism called ‘Mission Review’ that allowed people to write back to us and tell us where we weren’t living up to the mission, and then we had to respond, and we did. You have to build the mechanisms in for it, too. In a big organization you don’t just talk about it, you have to do something about it. Steve Motenko: In about 30 seconds, you mention in your book, you say, “Be accountable. Only the truth sounds like the truth.” What does that mean, “Only the truth sounds like the truth”? Howard Behar: Well, it came from a place when I was president of a land development organization. It was the first time I ever had to lay anybody off, and the layoff sheet was put on the copier and it was left there and somebody got it, and all of a sudden I had to respond to something. Now, some people said, “Howard, just lie and tell them that we were just talking about it but really not going to happen.” But my administrative assistant said to me, “Howard,” and looked me in the eye, she said, “Howard, only the truth sounds like the truth.” And she was so right. And so I told the truth. Steve Motenko: More with Howard Behar when we come back. You’re listening to ‘The Boss Show’. Steve Motenko: Hi, I’m Steve Motenko, I’m the psychology guy. We’re talking to Starbucks’ Howard Behar in part two of our interview. You can find part one on our website thebossshow.com or on your favorite podcast platform. Howard, we would be remiss if we- We’ve been talking for, now, two shows about your book ‘It’s Not About the Coffee’ because it’s all about leadership lessons and how to take a really pure vision and set of values and apply them to this very large and disparate organization spanning 5 continents, not 15 as I mistakenly said early because my tongue was getting ahead of my brain, but you have recently published a book called ‘The Magic Cup’, which is very different. It’s still about leadership. It takes place in the context of a fictional company, and it’s a leadership fable. Very fantastic, lots of alchemy. It’s kind ‘Alice in Wonderland’ with ‘The Wizard of Oz’ meets the corporate context. What possessed you to write this book? How it started was, I wanted to write a children’s book for adults on leadership. Steve Motenko: Yeah, that’s how it came across. Howard Behar: Yeah, and that’s what I was trying to do. To create it interesting and fun, but have leadership lessons in it and talk about what I call the ’11 Virtues’, or values, whatever you’d like to call them. Steve Motenko: Why a children’s book for adults? Howard Behar: Well, because we remember stories. That’s what we remember. We don’t remember facts, you know? We don’t remember buzzwords. We remember stories, and I wanted to tell a story that people would remember. That’s what I tried to do, with a lead character called Vince Steadfast, you know? He was the guy that went to this company. He wanted to be a CEO, and his ex-boss encouraged him, said, “God, I want to help you.” That’s what it is, and so ‘The Magic ‘Cup’ is, basically, it’s a simple human thing. As an example, what you put into your life is what you get out of it. That’s what this is about, is about the cup knows what you’re putting in, just like you know what you’re putting in to your own life. You put good, caring things into your life then the cup fills and it grows in size. You put greed, blind ambition in, the cup shrinks and empties out. I think we all want to live a life with a full cup. Steve Motenko: The lead character, Vince Steadfast, is given the cup early in the book by a mentor of his who says, basically, “Keep your cup filled.” Essentially. Howard Behar: That’s right. That’s right. Steve Motenko: Where do the 11 Virtues come from? How did you choose those 11? Howard Behar: Well, they kind of fell out of the stories. I had about 50 virtues that I had written down, and it kind of fell out of the story, so that’s how it came about. We were using the examples and said, “Well, what does this example represent?” The first one represented ‘Responsibility’, and on through the story. That’s how it happened. Steve Motenko: So you kind of allowed the story to organically unpack the virtues? Steve Motenko: It’s not like a pre-set list that you came in to the story with? Howard Behar: No, I didn’t have a pre-set list, no. 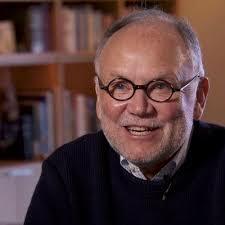 Steve Motenko: Howard Behar, again founding president of Starbucks International, what are you up to these days? Steve Motenko: Other than probably promoting the book full-time I guess? Howard Behar: Yeah, promoting the book, but I’m trying to do what fills my soul. You know what fills my soul? Nurturing and inspiring the human spirit. Howard Behar: Yeah, that’s one of them of course, but I want to change how leaders lead. I want to have people think differently about leadership, you know? We get so focused on Leadership with a capital L we forget that all leadership begins with a small l, and that’s the idea of learning to lead yourself first. If you do that well then you will have no problem leading other people or leading organizations. Steve Motenko: Jim and I are looking at each other, we can’t agree with you more. Jim Hessler: The first section of our leadership platform in our book is ‘Leadership of Self’. You have to start there. Steve Motenko: Yeah, and the notion of leadership with a small l. Everyone is a leader. Everyone who has any influence on any other human being is a leader. Howard, what a great pleasure to have you on ‘The Boss Show’, thanks so much for being studio with us! I look forward to our interview at the Conscious Capitalism event on May 17th. Howard Behar: Me too, thanks very much. Steve Motenko: You’re listening to ‘The Boss Show’. Speaker 4: Now back to Jim Hessler and Steve Motenko. This is ‘The Boss Show’ on KOMO News. Steve Motenko: Hi, I’m Steve Motenko, I’m the psychology guy. We’ve been interviewing Howard Behar of Starbucks, and one quote from his book I wanted to read is, “Leading others is an honor. It begins with an obligation. First, to continually develop yourself, and second, to help develop leaders.” Which is what we’re all about, Jim! Jim Hessler: It is what we’re all about. We hesitate to use our radio program as an advertisement for what we do, but I will say if you liked what Howard Behar had to say about the values of business, about bringing compassion and relationship, we have a wonderful leadership program, the Path Forward Leadership Workshop, that preaches that, I think, in a very effective and sustainable way. We’d like to invite you, if you’re interested in hearing more about that, to contact us. Steve Motenko: Yeah, at thebossshow.com or at pathforwardleadership.com. Our program, by the way, is a year long program which is- That kind of longitudinal approach is the only one that really effectively develops leaders. ‘The Boss Show’ was produced Boss Media Productions and our sound engineer is Kevin [inaudible 00:25:16]. Steve Motenko: If you missed any of this show you can get it in its entirety online at thebossshow.com. Jim Hessler: Well, we’d like to thank you for listening. Steve Motenko: And don’t forget Rule #6.